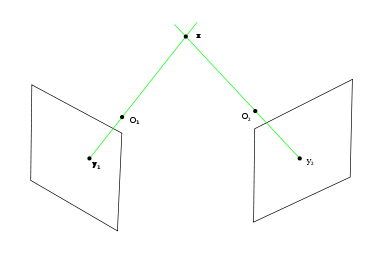 How Kinect depth sensor works – stereo triangulation? Kinect use depth sensor produced by PrimeSense, but how exactly it works is not obvious from the first glance. Some person here, claimed to be specialist, assured me that PrimeSense sensor is using time-of-flight depth camera. Well, he was wrong. In fact PrimeSense explicitly saying they are not using time-of-flight, but something they call “light coding” and use standard off-the shelf CMOS sensor which is not capable extract time of return from modulated light. Daniel Reetz made excellent works of making IR photos of Kinect laser emitter and analyzing it’s characteristics. He confirm PrimeSense statement – IR laser is not modulated. All that laser do is project static pseudorandom pattern of specs on the environment. PrimeSense use only one IR sensor. How it possible to extract depth information from the single IR image of the spec pattern? Stereo triangulation require two images to get depth of each point(spec). Here is the trick: actually there not one, but two images. One image is what we see on the photo – image of the specs captured by IR sensor. The second image is invisible – it’s a hardwired pattern of specs which laser project. That second image should be hardcoded into chip logic. Those images are not equivalent – there is some distance between laser and sensor, so images correspond to different camera positions, and that allow to use stereo triangulation to calculate each spec depth. The difference here is that the second image is “virtual” – position of the second point y_2 is already hardcoded into memory. Because laser and sensor are aligned that make task even more easy: all one have to do is to measure horizontal offset of the spec on the first image relative to hardcoded position(after correcting lens distortion of cause). That also explain pseudorandom pattern of the specs. Pseudorandom patten make matching of specs in two images more easy, as each spec have locally different neighborhood. Can it be called “structured light” sensor? With some stretch of definition. Structured light usually project grid of regular lines instead of pseudorandom points. At least PrimeSense object to calling their method “structured light”. Got myself new and shiny Asus u35jc-a1 and started dual boot Ubuntu on it. I have ubuntu as wubi(ubuntu in windows file) on my old desktop replacement Dell XPS, so I started with wubi for u35jc too. Wubi worked from the start, wifi card works without problem. However NVIDIA completely screwed up hybrid driver for Linux(there are 2 vidoecards on u35jc, one integrated and other NVIDIA), it’s completely unusable, so NVIDIA driver should be disabled. Happily there are detailed instructions on ubuntuforums. They are for 10.4, but work for 10.10 too. Suspend was not working quite stable though, even after fix from ubuntuforums. It’s tricky – suspension require turing NVIDIA driver on and off.. Suspend was working for AC power, but suspend on battery power caused system hang someteimes. I proceed to multituch fix from the list. Multituch fix require creation or modification of xorg.conf, wich require stopping X. Stopping X caused crush which permanently killed Ubuntu wubi install. That was quite scary, so I decided to forgo wubi and make complete ubuntu intallation into partition. Installation was not completely smooth. Probably because of some quirks of initial Asus partition, ubuntu installer refused to create any partition but first in the free space. After creation of the first boot partition remaining free disk space become unusable. So I forgo swap partition and installed ubuntu into single / partition. After that I implemented only acpi_call and suspend fixes. Suspend now works like charm, both for AC and battery. Multitach fix I put aside for now – it’s not critical. It seems all the problem, necessity of separate suspend fix, problems with wubi and stopping X were caused by NVIDA driver. Hope NVIDIA will fix it eventually – I want to play with GPGPU without going into Windows boot. Genetic algorithms and especially their subset, Genetic programming were always fascinating me. My interest was fueled by on and off work with Global optimization, and because GA just plain cool. One of the most interesting thing about GA is that they work quite good on some “practical” problems, while there is no comprehensive theoretical explanation why they should work so well (Of cause they are not always so useful. There was a work on generating feature descriptors with GA, and results were less then impressive). Historically, first and most well known explanation for GA efficiency was the building block hypothesis. Building block hypothesis is very intuitive. It say that there are exist “building blocks” – small parts of genome with high fitness. GA work is randomly searching for those building blocks and combining them afterward, until global optimum is found. Searching is mostly done with mutation, and combining found building block with crossover (analog of exchange of genetic material in real biological reproduction). However building blocks have a big problem, and that problem is crossover operator. If building block hypothesis is true, GA work better if integrity of building blocks preserved as much as possible. That is there should be only few “cut and splice” points in the sequence. But practically GA with “uniform” crossover – massive uniform mixing of two genomes, work better then GA with few crossover points. Recently a new theory of GA efficiency appears, that try to deal with uniform crossover problem – Generative fixation” hypothesis. The idea behind “generative fixation” is that GA works in continuous manner, fixing stable groups of genes with high fitness and continuing search on the rest of genome, reducing search space step by step. From optimization point of view GA in that case works in manner similar to Conjugate gradient method, reducing (or trying) dimensionality of search space in each step. Now about “uniform crossover” – why it works better: subspace, to which search space reduced, should be stable (in stability theory sense). Small permutations wouldn’t case solution to diverge. With uniform crossover of two close solutions resulting solution still will be nearby attractive subspace. The positive effect of uniform crossover is that it randomize solution, but without exiting already found subspace. That randomization clearing out useless “stuck” genes (also called “hitchhikers”), and help to escape local minima. Interesting question is, what if subspace is not “fixed bits” and even not linear – that is if it’s a manifold. In that case (if hypothesis true) found genes will not be “fixed”, but will “drift” in systematic manners, according to projection of manifold on the semi-fixed bits. Now to efficiency GA for “practical” task. If the “generative fixation” theory is correct, “practical” task, for which GA work well could be the problems for which dimensionality reduction is natural, for example if solution belong to low-dimensional attractive manifold. (addenum 7/11)That mean GA shouldn’t work well for problem which allow only combinatorial search. Form this follow that if GA work for compressed sensing problem it should comply with Donoho-Tanner Phase Transition diagram. Overall I like this new hypothesis, because it bring GA back to family of mathematically natural optimization algorithms. That doesn’t mean the hypothesis is true of cause. Hope there will be some interest, more work, testing and analysis. What is clear that is current building block hypothesis is not unquestionable. Simple googling produced paper by Beyer An Alternative Explanation for the Manner in which Genetic Algorithms Operate with quite similar explanation how uniform crossover works.